German Mechanical Engineering Company and German Bundesliga club make themselves strong together for handicapped children and young people. Oliver Keller, Head of Sales SV 98, Dr. Arne Brüsch, CEO DATRON AG and Anja Boutbel of the Bärenstark Intensivpflege with the donation of € 5.555 for the Bärenstark Intensivpflege. 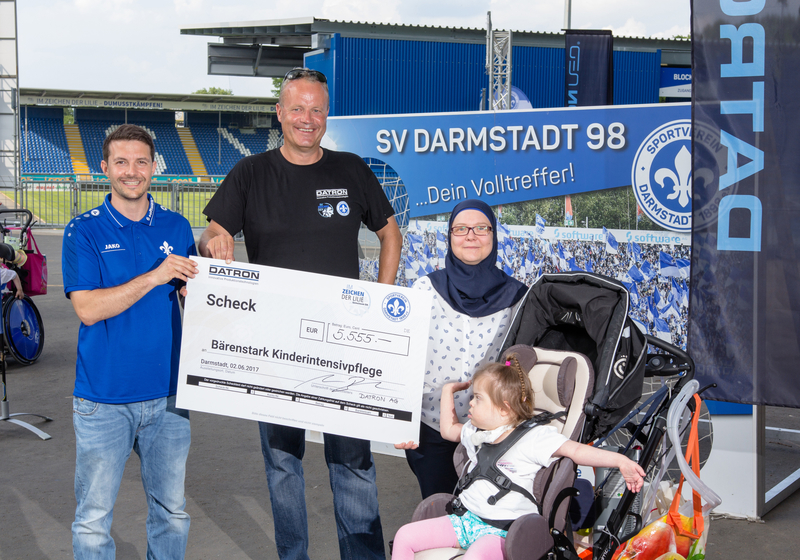 Mühltal, 13.06.2017 - Under the motto "No Need for Speed", DATRON AG and SV Darmstadt 98 on June 2, 2017 together organized a charity run in favor of the " Bärenstark Intensivpflege." Within the social campaign "In the sign of the lily” about 120 runners, walkers and cyclists showed their sporting commitment and completed the route from both DATRON AG company sites in Mühltal-Traisa and Darmstadt’s Landwehrstrasse all the way to the Jonathan-Heimes-Stadium at Darmstadt’s Böllenfalltor. Each participant increased the basic donation sum with their participation in the charity event. 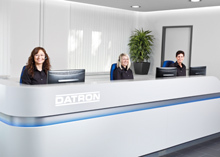 Eventually Dr. Arne Brüsch, CEO of DATRON AG, and Oliver Keller, Sales Director of SV Darmstadt 98, were able to hand over a check over EUR 5,555 to Anja Boutbel of the Bärenstark Intensivpflege. The donation sum is intended for children and adolescents who require intensive care, which the initiative "Bärenstark" from Darmstadt offers through optimal nursing, medical, therapeutic and pedagogic care. Dr. Arne Brüsch, who did not miss the chance to take part in the charity race personally, is delighted at the high participation of DATRON AG employees and SV Darmstadt 98 employees, as well as the amateurs who secured their starting positions in a social media lottery of the SV 98: “At DATRON, the social responsibility among employees is intensely felt. I always look forward to a joint event with the SV 98 and to effect something positive jointly with the club. The high participation for this charitable purpose confirms that we do the right thing. "